A dear friend sent me this book when I had my baby a few months ago. 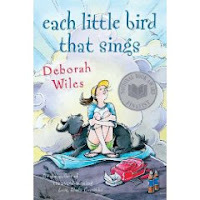 She said that she loved this book - along with all other books by Deborah Wiles, and that when I got time she knew I would enjoy it too. I finally got to it and she was so right, I loved it! Comfort Snowberger is ten years old and her family owns the town funeral home, she attends each and every funeral, so she thinks she knows everything there is to know about death. The story is a pre-teen book (9-12 year olds) and full of ten year old wit and wisdom. I loved it and laughed out loud at parts! The plot of the story revolves around the funeral of Comforts Great-great-aunt Florentine. Comfort is asked to help with her younger and very annoying cousin Peach all while she is having trouble with her best friend Declaration. The book takes a turn at the very end and Comfort learns a lesson on what is really important to her, who she is and her family. I believe one of my favorite parts of the entire book is the passage below. In a world like we live in now - this turned into a great message for pre-teens, or any age, to read. "You did the right thing even when, somewhere deep inside you, you didn't want to. Because you knew, somewhere even deeper, that it was the right thing to do."